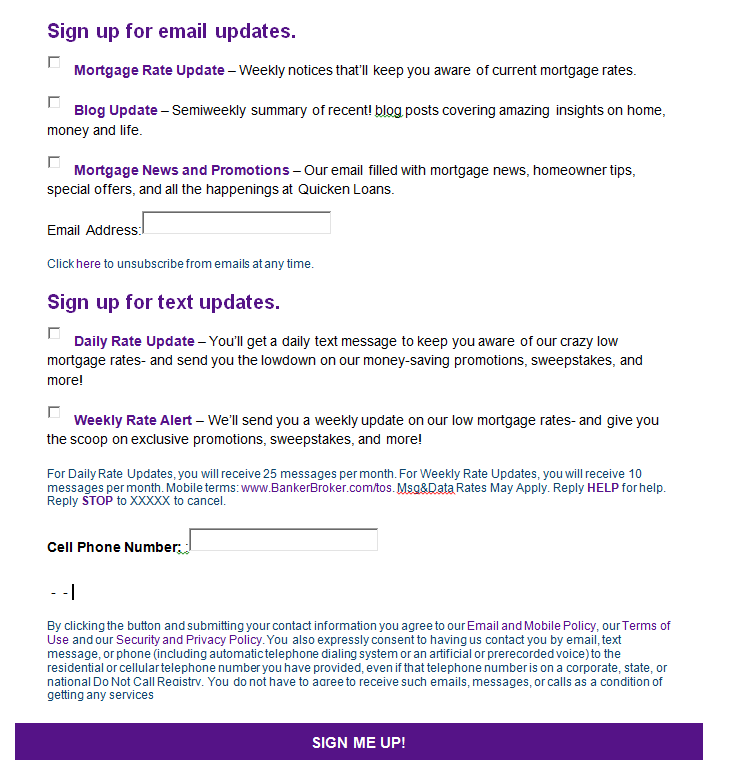 Mortgage Rate Update – Weekly notices that’ll keep you aware of current mortgage rates. Blog Update – Semiweekly summary of recent! blog posts covering amazing insights on home, money and life. Mortgage News and Promotions – Our email filled with mortgage news, homeowner tips, special offers, and all the happenings at BankerBroker.com. Daily Rate Update – You’ll get a daily text message to keep you aware of our crazy low mortgage rates- and send you the lowdown on our money-saving promotions, sweepstakes, and more! Weekly Rate Alert – We’ll send you a weekly update on our low mortgage rates- and give you the scoop on exclusive promotions, sweepstakes, and more! For Daily Rate Updates, you will receive 25 messages per month. For Weekly Rate Updates, you will receive 10 messages per month. Mobile terms: www.BankerBroker.com. Msg&Data Rates May Apply. Reply HELP for help. Reply STOP to XXXX to cancel.